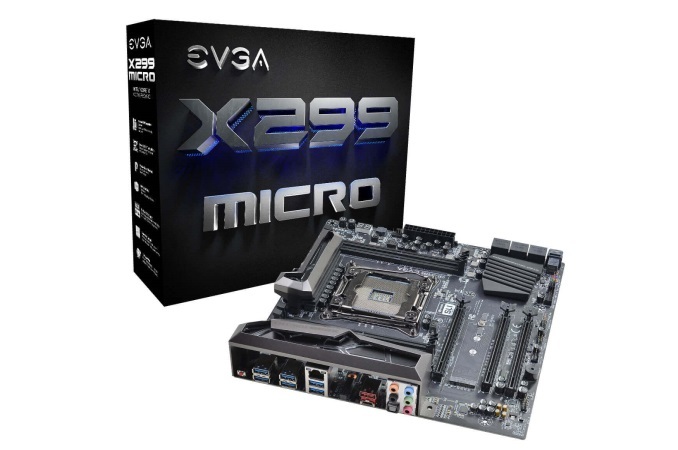 The EVGA X299 Micro Motherboard is mid-range microATX offering aiming to please a wide range of users but isn't marketed towards any one function in particular. It supports 2-way SLI, includes a U.2 port, an M.2 slot, and has Wi-Fi connectivity via an included card. It sits as the second smallest commercial X299 motherboard, behind the X299E-ITX. For the X299 platform, as they did with X99, EVGA has the fewest motherboard SKUs compared to the other major board partners, a total of three. These range from the flagship X299 Dark, the mid-range full-sized X299 FTW K, and the X299 Micro which we are looking at today. For high-end desktop platforms, any movement to reduce the motherboard size usually comes at the expense of features. Sometimes a feature compromise makes sense, if a smaller product is aiming for a specific crowd, however it takes a good motherboard design to make the most of the key features of the platform in such a small size. EVGA, for the X299 Micro, attempts to make the best of both worlds: the board supports a full set of quad-channel memory, although only one module per channel, and rather than doing two network ports, changes one for a wireless card. The PCIe lane layout is optimized for a dual-GPU setup, and EVGA puts the other lanes to use with two different PCIe storage implementations. The X299 Micro has three full-length PCIe slots, supporting up to 2-way graphics. The physical slot configuration allows for a dual slot GPU to fit in the primary GPU slot (top) and the secondary just below it. Technically EVGA's manual suggests support for SLI plus an additional PhysX graphics card, should single-slot GPUs be in play, with the third slot being a PCIe 3.0 x4 from the chipset. For storage, between the PCIe slots is an M.2 slot, supporting both PCIe and SATA modules up to 80mm. 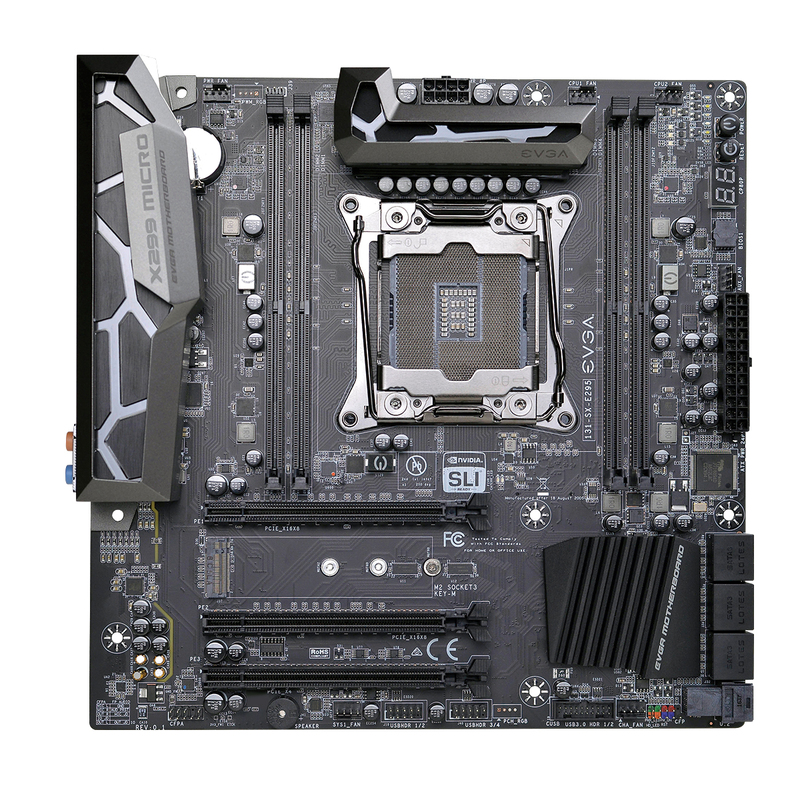 In addition to the M.2, the X299 Micro also has a U.2 port below the six SATA ports. with all SATA, M.2, and U.2 lanes fed from the chipset. The Micro has information voltage LEDs which note if there is an abnormal voltage detected. There are two additional LEDs in the same area that will light up depending on which processor is installed. It also includes power and reset buttons as well as a debug LED for POST codes (and temperatures once it goes through POST). EVGA mentions a 12-phase power delivery, and has a heatsink which looks like it can handle the load. USB connectivity on the Micro offers users two USB 3.1 (10 Gbps) ports, one Type-A, and one Type-C, managed by the ASMedia 2142 controller (most boards in this class use the newer and more efficient ASMedia 3142 controller), but does not include front panel 10 Gbps support. The chipset handles eight USB 3.0 ports (six on the back panel, one internal header) along with four USB 3.0 internal headers. The network side of the house is handled by a single Intel I219-V Gigabit LAN controller. Wi-Fi capabilities are handled by an add-in-card, an Intel 8260 card which is 2T/2R, supports speeds up to 867 Mbps and includes Bluetooth 4.2. The kicker here is users will have to install the diminutive card themselves. as it does not come pre-installed. Performance on the EVGA X299 Micro was solid overall outside of any tests using AVX instructions, with the motherboard usually around the middle of the pack. One of the better results in our power testing, however there is an issue here. In this AVX test, both EVGA boards so far have the clock speed dropping to 3.3 GHz, which is the base clock for the i9-7900X. After running this with Intel XTU monitoring in the background, it showed there is current limit throttling causing the CPU to drop to 3.3 GHz. X299 boards from other vendors do not have this issue. In our manual overclocking tests using our first CPU, the system was comfortable at 4.5 GHz, like the others we have tested so far. The current price on the X299 Micro is $290 on Amazon US. MSI has two MicroATX boards in their product stack; the X299M Gaming Pro Carbon AC ($301) and the X299M-A Pro ($222). ASRock has a Mini-ITX board, the X299E-ITX/AC ($400), while GIGABYTE and Asus do not currently have anything smaller than ATX in their lineups. EVGA's X299 Strategy relies on only a couple of boards, three, to complete their lineup as compared to others with close to, or more than, 10 boards filling out many of the nooks and crannies of the market. The least expensive board is the X299 Micro, reviewing here, which as its name implies is a MicroATX size motherboard. Next up the stack is the FTW-K. This E-ATX sized board will compete with other X299 mid-range offerings through its feature set and price. Finally, the flagship of the EVGA X299 stack is the X299 Dark which will match up with other board partner's flagship offerings. With Intel's release of the Basin Falls platform, encompassing the new X299 chipset and LGA2066 socket, a new generation of CPUs called Skylake-X and Kaby Lake-X were also released. The Skylake-X CPUs range from the 7800X, a hex-core part, all the way up to an 18-core 7980XE multitasking behemoth. Between the bookend CPUs are five others increasing in core count, as in the table below. The latter HCC models are set to be launched over 2H of 2017. Board partners have launched dozens of motherboards on this platform already, several of which we will have an opportunity to look over in the coming weeks and months. This specific review will cover the EVGA X299 Micro. To read specifically about the X299 chip/platform and the specifications therein, our deep dive into what it is can be found at this link. There has been some excellent work done by Igor Wallossek over at Tom’s Hardware, with thermal probes, thermal cameras, and performance analysis. The bottom line is that motherboard vendors need to be careful when it comes to default settings (if MCT is enabled by default) and provide sufficient VRM cooling in all scenarios – either larger and heavier heatsinks or moving back to active cooling. This means there are going to be some X299 boards that perform normally, and some that underperform based on BIOS versions or design decisions. We are in the process of quantifying exactly how to represent this outside of basic benchmarking, so stay tuned. In the meantime, take a look at the next motherboard for review.